Assos developed the SS.centoJersey evo8 for the rides and riders who are focused primarily on comfort. Some days we just want to take it easy, when the focus is on the simple pleasure of the ride. This is just the jersey for those relaxed days. Cut in Assos' comfortFit, the SS.cento_evo8 jersey’s construction and design have been refined and tuned at ASSOS HQ with luxury in mind. Taking design cues from the ever-popular falkenZahn, the front of the jersey combines two materials to allow more stretch, as well as giving the jersey a distinct look. Assos have employed the same material used in their rallytrekkingJersey in this SS.centoJersey_evo8, again giving more stretch to improve comfort while also giving you better performance. But don’t let this attention to comfort lead you to question its performance – far from it. This piece is the ultimate combination of luxury and performance. Borrowing technology from the top-of-the-range Campionissimo line it shares its race performance and first class comfort. 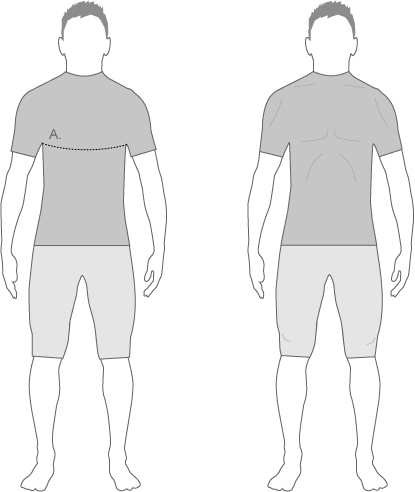 Taking the same mesh used in the rear of the campionissimo jersey, breathability is increased, thus making this jersey perfect for mountain climbs in the full heat of the sun. The technology and attention to detail is further demonstrated by the reinforced fabric on the rear pockets for improved performance; the vertical zip pocket with reflective strip for increased safety; the glued zip and waist for a cleaner look; as well as the holes in the rear pockets for extra breathability; you'll soon realise that this extra comfort does not come at the cost of performance. Combining the comfort and refinement of a boutique hotel with the technology and performance of a race car, and packaged in a striking design, the SS.centoJersey_evo8 is ideal for those days when you’re looking for comfort, to ride in opulence. But like any grand touring car, with leather seats and cruise control, push it a little harder, ask for a little more performance, and this jersey will jump to life. Assos SS.CentoJersey_Evo8 is rated 4.8 out of 5 by 5. Rated 5 out of 5 by Moosemillernotts from Assos Quality Probably the best made jersey you have ever brought, I think so and I've had enough of them in the last 30 years. Brands go in and of fashion but Assos quality continues. Rated 5 out of 5 by m1keD from So comfortable Ever since i bought this (and matching Cento shorts), the rest of my cycling jerseys and shorts all been sold or left in a draw. I wear this kit every single ride unless its winter, just one pair of each. Not one bit of stitching gone, perfectly comfortable. Its the little details too - like the rear right pocket has a tiny flap inside so you can put your phone in, tuck the top under the flap, then it will never come out. Is there a plan to have a large size option in black?